Despite showing sympathy for the victims of the Christchurch attack, Scott Morrison's past anti-Muslim rhetoric is not forgotten, writes James Fitzgerald. FOR ALL THE SYMPATHY and condolence shown during his press conference following the torrid and disgusting attack in Christchurch, where 50 people were killed by an Australian far-Right wing extremist, Scott Morrison’s previous comments on other such attacks as well as Muslim assimilation might just come back to haunt him. This horrific event took place and was targeted to one particular community – the Islamic community – in a mosque as they went to prayers in New Zealand. But in doing so, it was an attack on all peace loving peoples, on all innocent peoples. And that’s why we can all stand together in support of our Muslim brothers and sisters who were the specific targets of this attack. Nice, compelling and sympathetic in sentiment. But if we look back at the Prime Minister’s previous comments on this issue, we start to get a real insight into his thoughts and ideology in regard to Muslim immigration as well as statements that can be seen by many to have flamed the far-Right hatred and rhetoric. Following the Bourke Street attacks in November last year, the then Treasurer clashed with senior Muslim leaders and drew their condemnation when he stated that they were “continuing down a path of denial” and “making their communities less safe and more vulnerable” after community leaders declined Morrison’s private invitation for a meeting. This rhetoric we see from the now Prime Minister’s comments, following what was a tragedy in our own backyard, not only epitomises his complete lack of understanding and awareness of the Muslim community but sets a dangerous precedent and provides the far-Right extremists with further reason to feel their despicable actions are somehow justified. Further to this, in a Sydney Morning Herald article published in 2011, it was reported that Morrison was urging his shadow cabinet colleagues to capitalise on the apparent anti-Muslim sentiment he thought was being felt throughout the country. Morrison reportedly pushed then Opposition Leader Tony Abbott to take advantage of the issues of “Muslims in Australia” and their “inability to integrate” into Australian society. 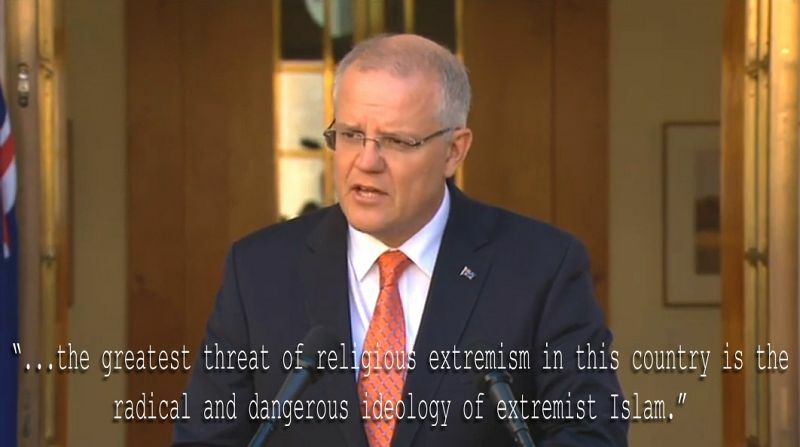 Morrison has subsequently denied these claims, but the pattern of anti-Muslim sentiment is plain to see from our now Prime Minister and shows that his reaction and sympathy towards the Christchurch attack is anything but a mere symbolic gesture. During his press conference, Morrison did firmly state that the actions of Australian-born shooter Brenton Tarrant were one of terrorism and that is commendable. Especially in a world where so many terrorist incidents and shootings by white, far-Right extremists are denounced as just mere shootings or attacks and not of terrorist activity. Yet, this does not take away from his previous comments made on other such attacks made from differing religious backgrounds. The Coalition’s stance on Muslim integration and immigration over the past eight years has fuelled this far-Right sentiment, if only by words alone and subsequently seen a rise in the far-Right in Australia after they have spent so long spewing their hateful rhetoric targeting the so-called “silent majority” of voters. Yet, herein lies the issue. Senator Anning’s remarks were certainly horrid and have no place within Australian Parliament, society or indeed the world. The Prime Minister’s response was apt and correct, but is there not a sense of the pot calling the kettle black from Scott Morrison after the Coalition's stance and comment on the Muslim faith within Australian society throughout his time in parliament? What we must now take from this horrible attack and hateful rhetoric that followed it is that this is not a new problem. Fuelling hate speech and racist ideologies of the far-Right within Australia from positions of power to win a few votes will only strengthen their resolve and we will see many more instances like Christchurch if politicians don’t stop marginalising minorities for political gain.